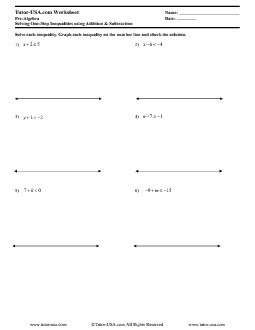 This Free Pre-Algebra Worksheet is comprised of problems on inequalities. Students must solve solve one-step inequalities using addition and subtraction, graph the solutions on a number line, and check their answers. Solve each inequality. Graph each inequality on the number line and check the solution.